Have you been having as much fun with Weight Watchers recipes as I have? I never thought I’d be making Weight Watchers pizza dough (also called skinny pizza dough), but here we are. You truly can eat anything while following the Weight Watchers lifestyle! I’m amazed every day at the different foods I eat – all without going over my points. 2 ingredient dough starts with, you guessed it, 2 ingredients! 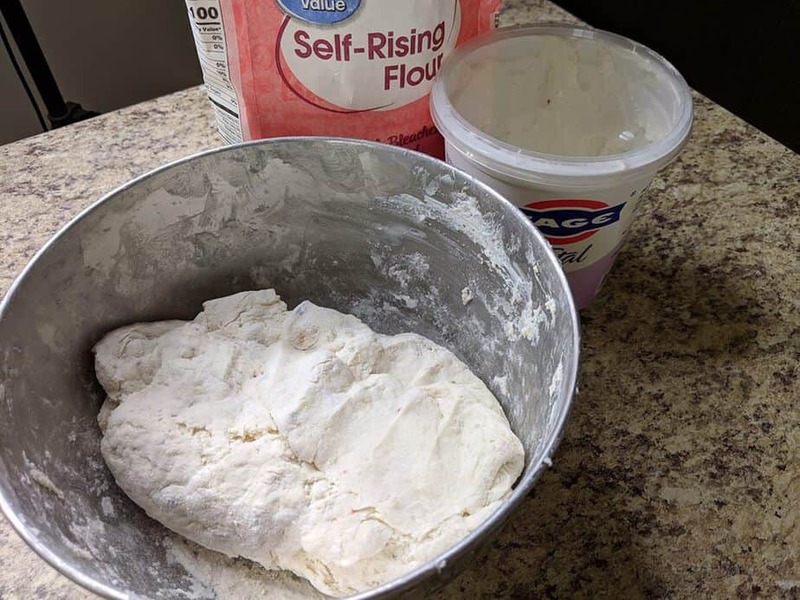 Mix 1 cup self-rising flour with 1 cup nonfat Greek Fage yogurt (yes, Fage! Brand matters here). I add in LOTS of garlic powder, crushed red pepper, a little salt, and sometimes a bit of Italian seasoning as well. Seasonings don’t add any points to your dough, so go crazy! If you’re worried about tasting the yogurt, don’t be! I’ve found two tricks that will keep your dough from tasting “sour” like Greek yogurt does. Keep the dough thin and well seasoned. You can be heavy-handed on the spices without adding points, so why not go all out? Let me know which seasonings you like to use in the comments! 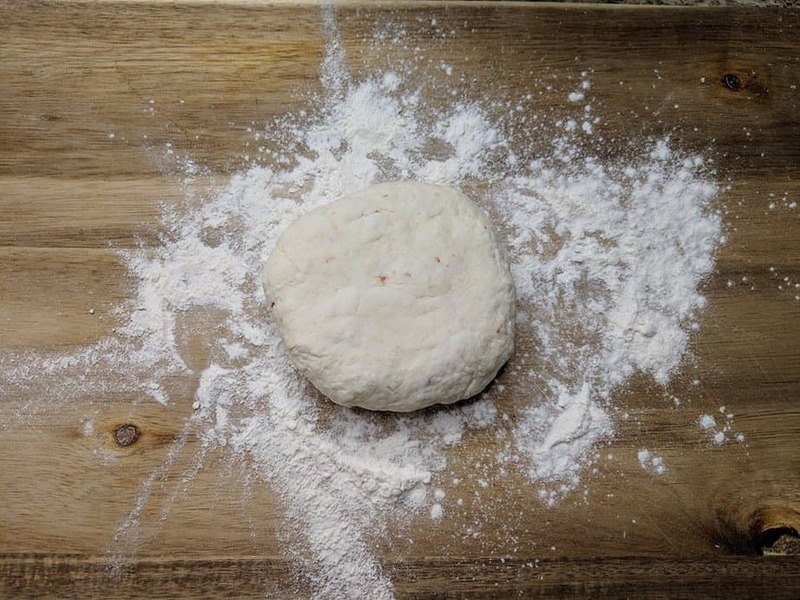 You may need to add a little extra flour to keep your dough from being sticky, but keep in mind that adding flour adds points! So only use as much a you need to. Stickiness of dough depends on lots of things, including altitude and humidity. If your dough is too dry, add more yogurt (which doesn’t add points – nonfat Greek yogurt is 0 points). Don’t forget the seasonings! 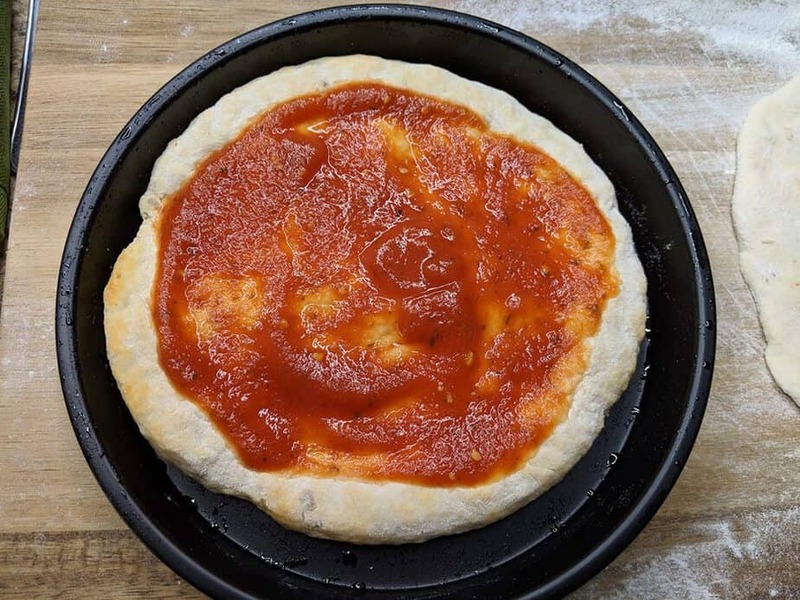 When working with the dough, honestly you can make SO MANY THINGS, but pizza is what we made today (along with some breadsticks with leftover dough). Add as much or as little sauce as you’d like, but keep in mind that canned pizza sauce does have points. You can make your own with fresh tomatoes without adding points (unless you count blended foods as points, which I do not), just avoid adding sugar – stick with lots of spices and seasonings! To prevent bubbling, you may want to use a fork to make holes in your pizza. Bubbles don’t always happen, but 2-ingredient dough tends to rise – A LOT – so it’s good to play around with it and see what works best for you. This is another reason I roll my dough out as thing as possible; you don’t want doughy dough! 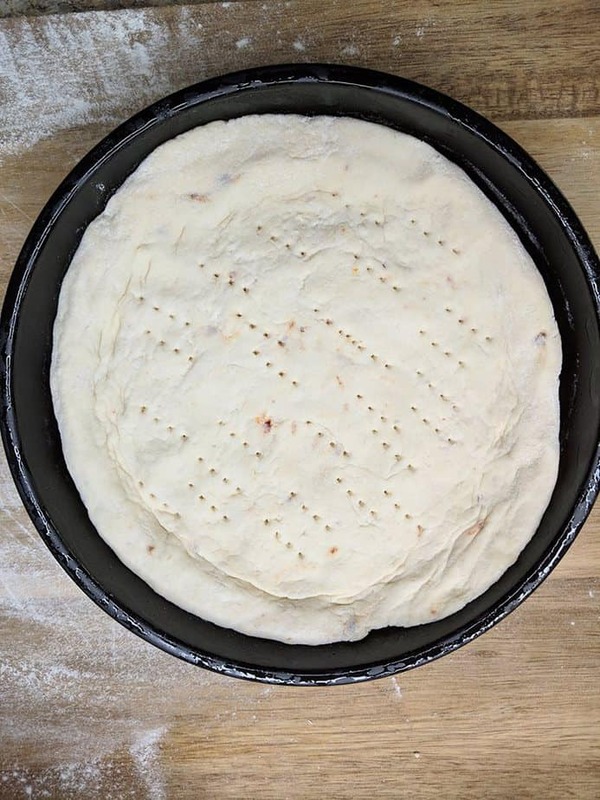 This skinny pizza dough is easy to double, triple, or even quadruple without having any problems… and it keeps in the fridge for at least a week (always disappears sooner in our house!). 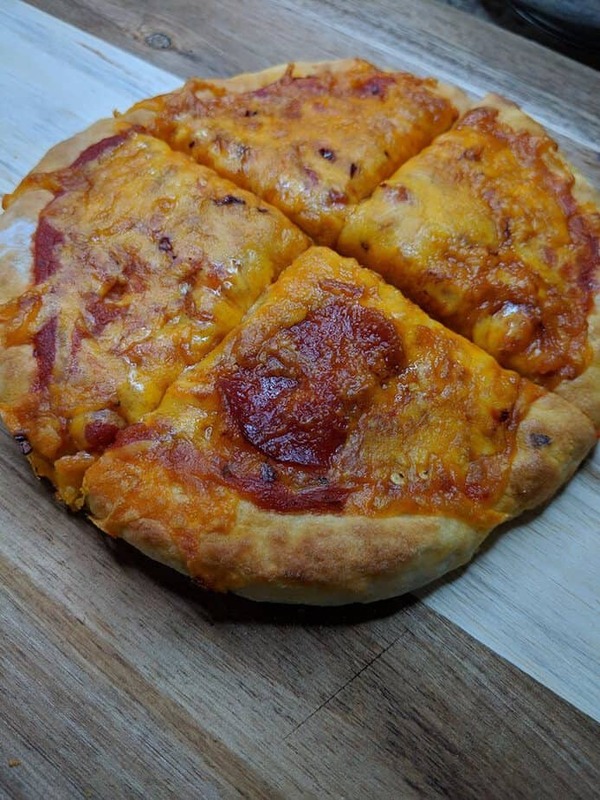 Remember, the key to perfect Weight Watchers pizza dough is SEASONING! Don’t skimp! 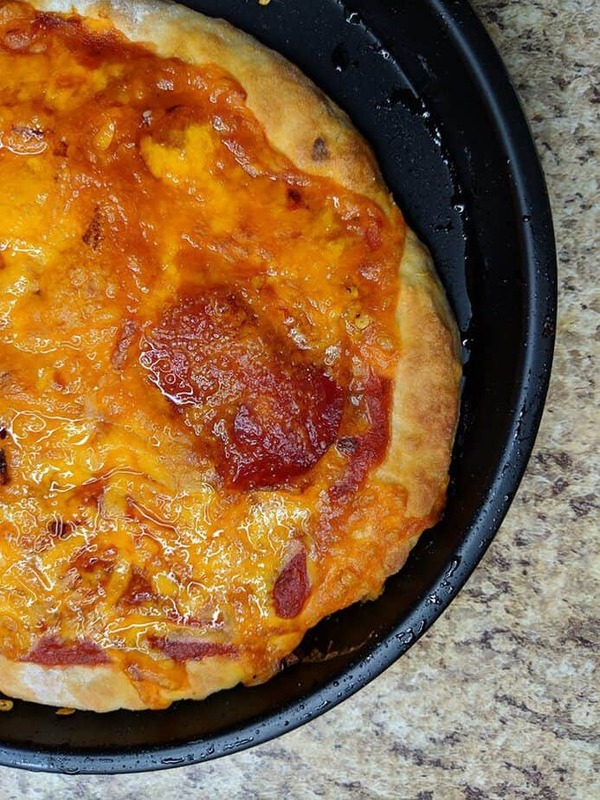 Here’s a recipe for a simple, low point Weight Watchers pizza using 2-ingredient dough. It’s almost too easy to call it a recipe, though. Use the dough, and add some sauce and toppings! Load up with high protein toppings to stay full longer without increasing your points. Serve with low point jalapeno poppers!